I love to order deep-fried tofu with peanut sauce as an appetizer in Thai restaurants, but I’m always hesitant to make it at home—mostly because I don’t love the idea of deep-frying innocent, healthy tofu. Well, thanks to my brilliant friend Kim, I found a fabulous way to fry tofu without bathing it in oil. This easy method yields tofu with a wonderful crust, reminiscent of deep-fried tofu, but with no more than a few tablespoons of oil in the whole recipe. Today I paired it with peanut sauce, but it’ll surely be showing up in upcoming curries and stir-fries. Preheat oven to 300 degrees F. Lightly oil (or line with parchment paper) a baking sheet). Place the tofu on a clean cutting board and cover with a second cutting board. Place a heavy book or a few heavy cans on top of the second board, to weigh down the tofu and press out the liquid. Allow it to drain for about 20 minutes Kim's post called for 40 minutes, but I was impatient. This method worked for me, but feel free to press it for all 40 minutes. Cut the pressed tofu into 2" triangles (as pictured), or any desired 2"-3" shape. 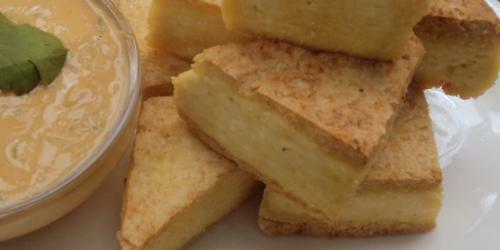 Arrange the tofu on the prepared baking sheet and lightly brush or mist with oil. Bake for 12-13 minutes, then flip and bake on the other side. If you haven't already made the peanut sauce, now is an excellent time. Heat 1 tbsp oil in a medium frying pan over medium-high heat. When oil is hot, add the tofu, working in batches if necessary, and fry the tofu for 2-3 minutes on each side, to ensure it gets really crisp. Drain the crisp tofu on paper towels and salt immediately. Serve warm with the peanut sauce for dipping. Makes about 16 pieces tofu and about 3/4 cup peanut sauce. In addition to doing basic banking transactions, citibank likewise markets credit cards, insurance coverage & investment-related items.